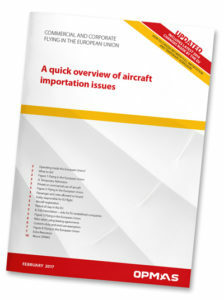 We have now made an updated version of our brief about importations in general. The previous versions of the brief have been read more than 10,000 times by operators from all over the world. It is our hope that just as many will find the new version just as informative. A lot of the EU Customs regulation have changed in 2015-16 and we have worked hard to fine-tune our services to take advantage of these changes. Full importation has become very difficult as the new preconditions are hard to meet for non-EU entities if not impossible, and thus our focus has changed to Temporary Admission in order to offer the best possible and secure way to fly without issues inside the EU. Full importation is now only for entities fully established in the EU. Many non-EU operators will probably be able to benefit from Temporary Admission without any help from customs specialists but we will be glad to help in the more complex cases. You are always welcome to contact us and hear about your options free of charge. We will send you our input to the same day and quite often within 1-2 hours. We are always available anytime for a call or an email.